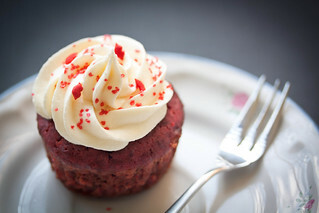 Food historians may differ about the origin of red velvet cake, some uses the entire bottle of artificial red food colouring, while some uses beets puree/juice. But one thing is certain: if you omit using artificial red colouring, recipe should use natural cocoa powder not dark or dutch processed (Hershey’s cocoa powder works perfectly but not the Special Dark variety). 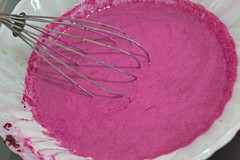 In this recipe we use beet and beetroot powder instead of red colouring. However, if you prefer a vivid red, feel free to add the red colouring to suite your personal preference. 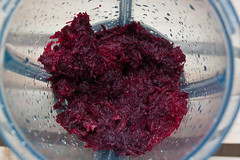 1) Grate peeled raw beet and then puree it in food processor (about 10min) to as fine a texture as possible (add a few spoonfuls of water if necessary.) Tips from Big Cake Theory. 2) Preheat oven to 350 degrees (165 degrees celsius). 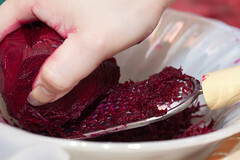 Place beets in a small baking dish and add ½ cup of water. Cover with parchment paper and foil, and roast until quite tender, about 60-90 minutes. Allow to cool completely. Peel the beets and cut into large chunks. Place in a food processor and pulse until smooth and pureed. Stir in the vinegar. - Tips from Sophisti Mom. You can use your favorite butter/cream cheese frosting or you can click HERE for the recipe. 1. Preheat the oven to 175C. 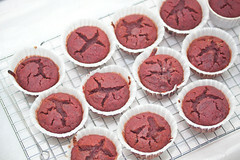 Line 12-cup muffin pans with cupcake papers. 2. Grate peeled raw beet and then puree it in food processor (about 10min) to as fine a texture as possible, add a few spoonfuls of water if necessary. 2. 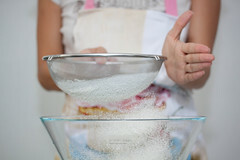 Sift together dry ingredients and set aside. 3. 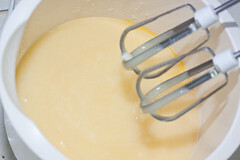 Cream the oil, sugar and vanilla extract on medium speed in a mixer. Beat in eggs one at a time, mixing until combined. 4. 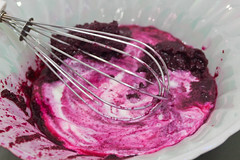 In a separate bowl, whisk the vinegar, beet puree and buttermilk. 5. Alternate adding the dry and wet ingredients to the creamed mixture, mixing until combined. 6. 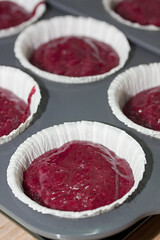 Divide the batter evenly among the cupcake pans about 2/3 filled. Bake in oven for 18 to 22 minutes, turning the pans once, half way through. Test the cupcakes with a skewer for doneness. 7. Remove from oven and cool completely before frosting. 8. Prepare the cream cheese frosting just before you are going to use it. Spoon them into a piping bag to decorate the cupcakes. Sprinkle some cake crumbs/sweets or eat it plain, they're equally tasty and beautiful. The results are mouthwateringly good! 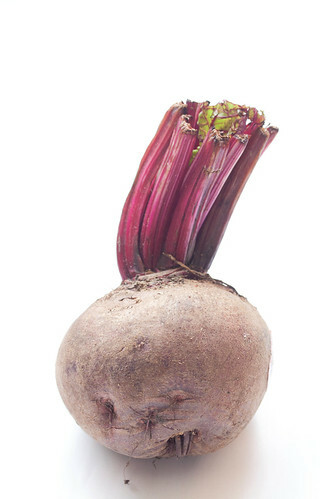 We love the unique flavour from the beet. This will be a hit for Valentine's Day, Christmas, or any other special occasion where red and white are the colors of choice (even our Singapore's National Day!). Thank you so much for sharing. 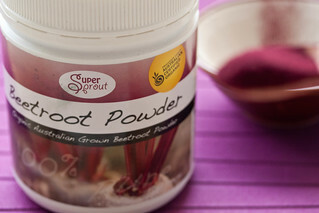 i was dying to know if we can used beet root instead of red food colouring. trying as much organic material as i can for baking as well.... phewww.. now i found the solution! I am glad that the recipe came useful to you! I did some research and test before I came up with this recipe. 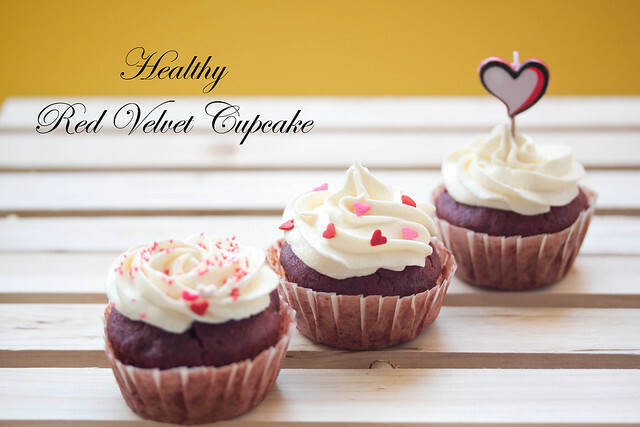 Personally I like it very much but the redness is a little dark compare to commercial red velvet, but its healthy and tasty, who care about the redness, right? I made this recipe last night and it came out pretty good! I am doing test trials on cupcakes for a bridal shower and chose this one. The one thing I did not have and couldn't find at any of our health food stores (tried 5 in our area and 3 grocery stores) so I just used a little more beets. Came out great but I can taste the vegetable oil.... It's one of my pet peeves and to me it has a very distinct flavor especially the next day for some reason. Is there any way I could substitute something else for the vegetable oil, like maybe applesauce? I would love some feedback, thanks! Nice to hear from you! I am glad that the recipe turn out well. Sorry to know you have trouble finding the beetroot powder, I got mine from a organic shop. I know some vegetable oil has a strong smell, I usually used canola oil. Or you can try olive oil too. If all type of oil are still too distinct, you can substitute with butter. But it will affect the texture of the cupcake. 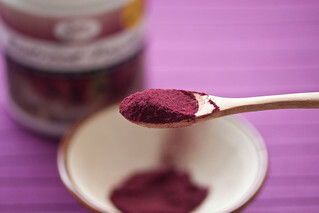 Can I only use beet root powder as the coloring? (Omitting the pureed beet). If possible, how? when to mix it? with what ingredients? does the powder need to be mixed with water or something liquid to activate the coloring? I am asking because yesterday I made a recipe with pureed beets and as much as I like to eat beets, I hated tasting them in my cupcakes. 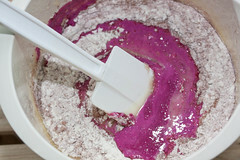 You can use beet root powder as colouring, however the colour won't be as strong as from the pureed beet. 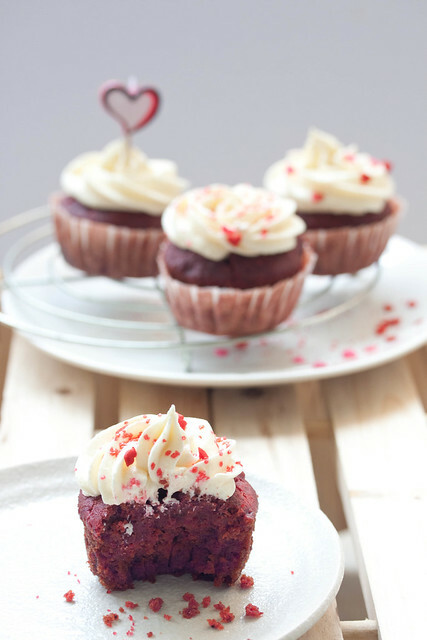 Plus the pureed beet gives additional moist to the cupcake. You can add the power in step 5, all the dry ingredients together. There is no need to add water. U can follow the same recipe & step and just omit the pureed beet. however do note that the texture may differ. If you don't like the beet root taste, you can add red colouring and that will resolve all the problem. 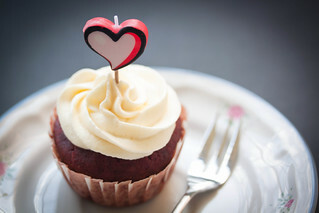 I had made this cupcake for friends, and they don't find the beet root taste strong, perhaps you want to give it a try? All content & photographs in Celestial Delish ツ are Copyright © 2009. No part of the content may be use without prior written consent from the owner.